Alongside the film was also a photographic exhibition of images I had taken around the hospital, documenting the amazing work that goes on there, despite the conditions of the fabric of the hospital. Here are some images of the exhibition of prints, and some photographs by Theodore Wood from the event, showing Princess Eugenie viewing the exhibition and being presented a print on her departure from the event. To make donations to this extremely worthwhile project to rebuild one of the world’s top three orthopaedic hospitals, please visit the RNOH Charity website. Thank you. HRH Princess Eugenie of York is also helping raise funds for the hospital by taking part in 100km bike ride; please pop by her page and make a donation if you can. A while ago Canon contacted me asking if I’d be interested in evaluating a new printer they were about to launch. At this early stage things were pretty hush hush, but I showed my interest and as time went on, it turned out to be a new 24” roll printer, part of the large format printer range, the iPF6300. The main reason they had approached me turned out to be that this is the first large format printer they are pitching towards photographers as opposed to graphics studios or labs. With it’s 12 Lucia EX inks which are reported to last 120 years, the 24” width (meaning prints can be as long as the roll of paper will allow at 24” width) and infinite paper media handling abilities, it seems very apparent that this was indeed aimed at us and my appetite grew as I awaited its delivery. As most photographers who look into printing in-house, I’d owned several A3 printers and was happy with my current printer, an A3+ capable Canon 9500 MkII. This “little” printer performed admirably, gaining complements from several quarters. However my appetite was for bigger prints and the timing of the iPF6300 was spot on perfect. On setting up, a special calibration roll of paper needs to be installed in the printer. A special pattern is printed on this reference paper and the built in calibration device reads this pattern of shapes of colour to adjust and set itself up for all of the Canon papers for one’s geographical region. This means that as long as the correct ICC profile is chosen, the print will be perfect. Although Canon’s gloss paper is very good and the Glacier paper (which is a heavyweight lustre paper) is now a favourite, my main interest was to try some third party papers, and specifically the Hahnemuhle range. Canon bundle a media configuration software for just this purpose when using papers outside of the Canon family. Once the roll of paper is installed (very straight forward – do use gloves though to keep your paper clean), the paper’s surface finish and weight are input into the software and an option to do an automated setup is offered; highly recommend you use this option. The printer then prints a test pattern, reading the pattern as it prints. This helps the printer set up the advance rate, vacuum strength and printer head height, optimising it for this paper. All this info is saved and sent to the printer for future use and is only done once for a new paper type. As long as this setup is done and a correct ICC profile is used, prints are printed to perfection. One downfall of testing a printer which has not yet been announced is that ICC profiles are not easy to get hold of. Hahnemuhle kindly supplied their profiles before going live with them, but the papers I was testing from Innova and Olmec didn’t have profiles. X-Rite however came to the rescue lending me a ColorMunki calibration tool. I used the device and software to calibrate my screen and set about making my very first paper ICC profile which proved to be extremely easy. In no time I had profiled all the papers and dove into to the task of testing the printer with colour and black and white images, on 12 rolls of Canon, Hahnemuhle, Innova and Olmec papers I had to hand. After printing my first A1+ sized print, once the awe of it’s size had subsided, I realised just how good this printer was. In my rush I’d just wanted to do a rough test print just to see. However this test print was stunning! The printer was showing it’s abilities straight from go, the media configurator and superb Canon Photoshop printer plugin working swiftly and efficiently. To finish, the ColorMunki had set up perfect ICC profiles. I threw image after image at the printer. Bright, highly saturated colour images, gentle, pastel coloured subtle images, contrasty and punchy black and whites and gentle and soft mono shots. Time and time again, the prints left me speechless. It didn’t matter what kind of photograph I was printing, or if the paper was matt or gloss, it performed brilliantly, time and time again. The only problems I had were one darkish and muddy print which turned out to be my fault as I hadn’t chosen the correct ICC profile in the printing plugin and an occasion where the heavyweight Innova FibaGloss 300 paper had scuff marks on one part of the print. I suspect that this is because of the curvature of the heavyweight paper and it’s gloss finish and that setting a stronger vacuum setting would hold the paper flatter. I also had issues with the Olmec Photo Satin 260 which if viewed from an angle produced a solarised look. Lastly the printer driver constantly crashed Aperture 3, but this I’m sure will be fixed by Canon in time as their other printers work perfectly with Aperture. In the printer’s plugin (as in the print driver), there is an option to set the print quality to standard, high or highest. My initial reaction at seeing the option was to use highest for all my work but decided to explore further. 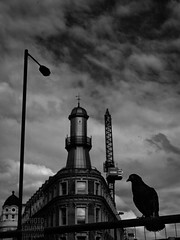 Having made prints from the same image on all settings, initially I couldn’t see any difference; they all looked good. On further and close scrutiny, I began to see some very subtle differences. 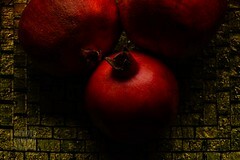 The image was from a model shoot on a 50 megapixel Hasselblad H3DII. On inspecting the pupil, the highest setting had rendered some of the subtle changes in tone and fine detail better; but only marginally when compared to the standard setting and the high setting produced an almost similar result. This is great news as it means that printing on lower setting produces much quicker prints and also saves on ink. On the subject of saving, apart from the initial outlay, running costs are cheaper when compared to smaller printers. Upon ejecting the paper, the printer can be set to print an identifier barcode which contains information of the paper type and also length of roll remaining, which I found extremely useful and an idea that is to be commended; with good quality papers demanding a premium, the last thing I would want is to mix up papers which would lead to wastage. I also must comment on the printer’s quietness in use. My office is generally pretty compact. Considering the size of prints it’s capable of, the unit’s relatively compact and quite when printing. The fact that it’s also such a speedy machine means that the printing’s done quickly and total silence returns with haste; a must in a creative environment. As the days went on, I began to start to admire some of the papers more than the others. I need to add though that all the papers, once setup, worked admirably well. My favourites ended up being the Canon Glacier and the Hahnemuhle Photo Rag 308 and quite possibly my absolute favourite, the Hahnemuhle Photo Rag Baryta. Every highlight detail, every shadow subtlety was printed with absolute precision. Having been a photographer for over 20 years, I’m from the school of hand printing, for which I have a couple of Kodak Press Awards. Having spent over a month or so with the Canon iPF6300, it’s the first time that I can confidently say that I can match anything I could do in the darkroom. For me, a higher accolade for a printer would be hard to come by. Unique. Not run of the mill. That’s what’s we strive for in our work. The constant battle to produce original and creative work. In this digital age though, it’s often too easy to have this work copied and for it’s value to be lost. Although an award winning hand printer (I have two awards from Kodak), I have completely embraced digital printing with Canon’s excellent iPF6300 large format printer. 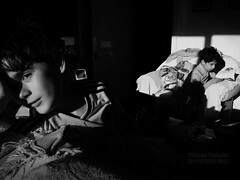 When combined with paper from Hahnemuhle and Ilford, the results are simply stunning. The downside is that due to the nature of it, it is hard to distinguish original and authorised prints from anyone unscrupulous enough to have stolen the image and run off their own prints. As well as signing the work, I decided to look into embossing and following a chat with a good friend, decided have my own one made by the folks at City Co Seals. I now emboss my collector’s prints and also use a custom made stamp to authorise and help the collector prove that they have an original. Give them a call and ask to speak to Grant; they are extremely helpful and very efficient. Do pass on my hellos if you call! It’s always very exciting when evaluating a new product. Being one of the first on the planet to try something out that’s going to enhance one’s future workflow or a new tool which will add benefits is great. It goes without saying that this is how it felt when Canon asked me to evaluate their new 12 ink large format printer aimed at photographers; the iPF6300. However, it’s not all excitement and fun as there is a surprising amount of hard and laborious work involved. One of the things I was asked to evaluate was how the printer behaved with various papers; both Canon and third party. This entails having to make hundreds of prints, in colour and black and white, using a variety of images and also a variety of print settings on all these different papers. One hurdle I soon came across was that as this printer was so new and hadn’t even had it’s European launch, I was missing a large number of paper ICC profiles. These profiles, along with the correct media setting tell the printer how to print (how much ink, how to print the correct colour, which black ink to use and a host of other ‘under the hood’ settings which are chosen automatically) once the ICC and media settings are applied in the printer driver or plug-in. These ICC profiles simply didn’t exist. Canon had supplied me with most of the profiles for their wide range of papers but Hahnemuhle and Ilford didn’t yet have profiles and were working on getting them to me for some of their papers. I also had other papers from other manufacturers like Olmec too. At this point I asked to borrow a ColorMunki photo from Canon’s Gary Vaughan who had kindly trained me on the printer. 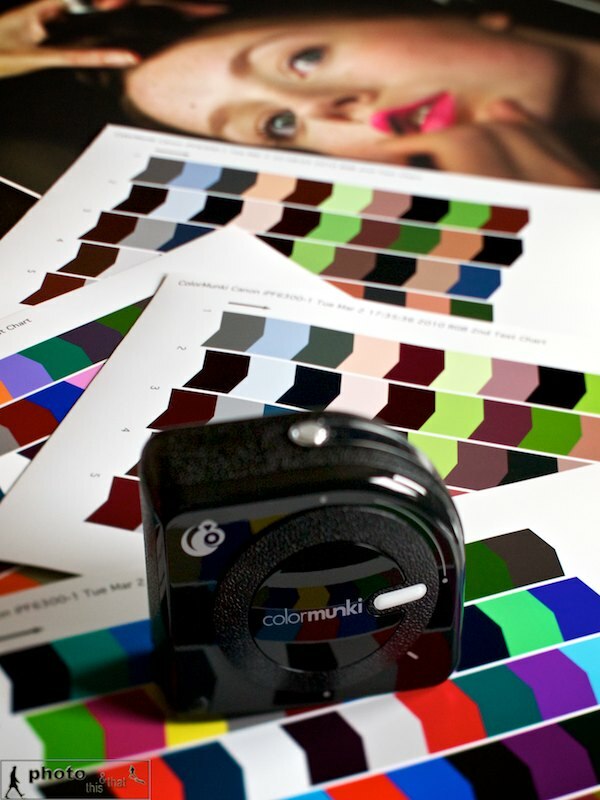 Apart from being used for screen calibrations, the ColorMunki from X-Rite can also be used to create ICC profiles for printing. I loaded up the software, read the concise instructions and was good to go. Although my screen was already calibrated using my Eye One Display 2 and Color Eyes software (with which I’ve always been happy) I decided to calibrate my screen with the ColorMunki too. One very neat feature is that it can measure the room’s ambient light and take this into consideration when calibrating the screen’s luminosity. After the screen was done I proceeded to getting my paper’s profile done, and chose Canon’s Glacier paper as my first port of call. I had already made some prints with this paper using a profile of a very similar paper but the results just didn’t sing. One extremely important thing to remember when making paper profiles is to make sure that colour management is switched off in the printer driver. The software guides the user through and I must say that I’m very impressed by the way it makes it child’s play to use. After a few steps, it prints out a colour chart which one then ‘reads’ with the ColorMunki puck. All you need to do is basically run the unit over the coloured bars, one column at a time. It then creates a second print out with a different set of colours and the same step is repeated, allowing the software to create an extremely accurate ICC for that paper. So easy and very smooth. I chose my newly created printer profile and made another print – this time the print sang. I must say, I’m so impressed with this unit. It’s so straightforward to use with extremely user friendly software and is such a capable unit calibrating my screen and printer paper that I’m in absolute awe. I cannot recommend this highly enough.